Giants manager Bruce Bochy says they expect Mark Melancon to close games at some point this season, per Kerry Crowley of The Mercury News. Melancon has been about as good as can be so far this year, scattering seven hits across ten scoreless innings. The 34-year-old has also finished five games for the Giants, though none were save opportunities. He’s no stranger to the ninth inning, having saved 182 games in his career, including a league-leading 51 for the Pirates in 2015. Melancon followed up that campaign by saving 47 games for the Pirates and Nationals before cashing in on his current four-year, $62MM deal, of which he will have one year and $14MM remaining after this season. The bullpen has been an area of strength for the 8-14 Giants, with lefty Will Smith the nominal ninth-inning anchor. Given the number of horror-show bullpens around the league right now, there’s likely to be trade interest in one or more of San Francisco’s high-performing relievers at some point this season. Melancon figures to stick around, however, as his deal is more cumbersome than the contracts belonging to Smith, Tony Watson, Nick Vincent, Sam Dyson et al. If the Giants do part with any of those veterans, it could open up a spot for Triple-A righty Ray Black. For now, however, the team has shut down Black for seven to 10 days on account of a right pronator strain, Henry Schulman of the San Francisco Chronicle was among those to tweet. It’s troubling news in light of Black’s injury-checkered past, and it continues a rough April for the flamethrowing 28-year-old. After posting a 3.16 ERA with 16.13 K/9 and 2.81 BB/9 in 25 2/3 innings at the Triple-A level last year, Black has pitched to a 6.43 ERA with 9.0 K/9 and 7.71 BB/9 in seven frames this season. He also had trouble preventing runs in a 23 1/3-inning major league debut in 2018, when he recorded a 6.17 ERA, though he did manage 12.73 K/9 against 3.86 BB/9. Free agent reliever Craig Kimbrel is “still in touch” with the Mets and Brewers, tweets The Athletic’s Ken Rosenthal, who notes that the Mets would only sign the 30-year-old if he were open to “any role” in the team’s bullpen. Rosenthal reported a week ago that the flamethrower’s price has dropped substantially, though whether or not he’s budged on the desire to pitch only in the ninth inning is still an open question. Both clubs’ pens have been far shakier than anticipated in the early going: indeed, apart from the lights-out performance of offseason acquisition Edwin Diaz, New York’s pen has arguably been the league’s worst. Milwaukee, too, has lost Corey Knebel to Tommy John, was without stalwart Jeremy Jeffress until this week, and has gotten middling-at-best output from all other contributors not named Josh Hader. Still, it’s the sloppy rotation – beset by a thus-far return to normalcy from Jhoulys Chacin and a gopher-ball binge embarked upon by rookies Corbin Burnes and Freddy Peralta – that seems most in need of the Crew’s attention. Allocating what little resources purportedly remain to anything other than a veteran starter would seem a curious choice indeed. Per Rosenthal, the Giants are already “willing to talk” about some of their veteran relievers, though closer Will Smith doesn’t appear to be among the names on the list. Lefty Tony Watson, who’s seen his average fastball velocity dip to a career-low 91.0 MPH, figures to be at the fore, along with the richly-paid Mark Melancon. Sam Dyson, Trevor Gott, and Nick Vincent, all of whom’ve had strong 2019 debuts, would likely also be in the mix, with the former’s $5MM 2019 salary seemingly the impetus for such an early position on the block. The club would likely jump at the chance to move Melancon, 34, who’s owed approximately $29MM through 2020. The former closer hasn’t allowed a run thus far in ten ’19 IP, but signs of major regression lurk beneath: the righty’s allowed hard contact at a rate of above 40% for the second consecutive season (after a career-high of 27.1% in his first nine MLB campaigns), has seen his swinging strike rate plummet to a career-worst 8.0%, and is again failing to strike batters out at an alarming rate. Any Melancon move would likely need to be offset by either another bad contract or a significant chunk of change heading with him, but the ever-creative Farhan Zaidi may yet have something up his sleeve. Cubs reliever Brandon Morrow, who’s mixed occasional big-league appearances around a litany of DL/IL stints in his 13-year MLB career, has been shut down in his attempted return from a right elbow injury. The 34-year-old was scheduled to miss just the season’s first month, but “did not recover well” from a bullpen session he threw earlier this week, according to MLB.com’s Jordan Bastian. The club, who’s already shuffled multiple bullpen pieces after a disastrous late-inning start in the early going, was counting heavily on Morrow to stabilize the mishmash crew. No timetable’s been set for the righty’s return, so the club will have to lean primarily on the well-traveled arms of Pedro Strop, Steve Cishek, and Brandon Kintzler in close-and-late situations. Giants leadership will consider some alterations to the dimensions of their spacious home park, Andrew Baggarly and Eno Sarris of The Athletic report in an exhaustive look at the matter (subscription required). Members of the ownership group posed the question of whether the right-field fences should be moved in and whether the bullpens should be moved to new president of baseball ops Farhan Zaidi in Spring Training; the first-year baseball ops leader agreed that it was at least worth exploring. Manager Bruce Bochy suggested to Baggarly that “Triples Alley” in right field would make an ideal spot for the bullpens to be relocated. “Personally, I feel if you hit a ball 400 feet, it should be a home run,” said the skipper. “So yeah, I think we should all be open minded to making a change.” Zaidi, meanwhile, stressed that the discussion is in its nascent stages. While he’s appreciative of the manner in which park-specific idiosyncrasies can impact roster construction, Zaidi also spoke of not “becoming so idiosyncratic that you become an outlier” that proves disadvantageous. Baggarly and Sarris explore just how much of an outlier the newly renamed stadium has become and also interview several players about the park’s dimensions. Top prospect Joey Bart, the No. 2 overall pick in last year’s draft, will miss the next four to six weeks of action due to a fractured left hand, Bochy announced to reporters Tuesday (link via Alex Pavlovic of NBC Sports Bay Area). The injury occurred Monday when the highly touted young catcher was hit by a pitch. Broadcaster Joe Ritzo, who covers the Giants’ affiliate in San Jose where Bart was injured, tweets that farm director Kyle Haines suggested that the team could send Bart to the Arizona Fall League after the 2019 season as a means of making up for some of the plate appearances he’ll miss while he’s down with the injury. The 22-year-old Bart hit .298/.369/.613 in 203 plate appearances for the Giants’ Low-A affiliate in 2018 and was off to a .270/.341/.541 start through 10 games and 41 plate appearances in 2019. Over the weekend, Kerry Crowley of the San Jose Mercury News took a look at Zaidi’s frequent shuffling on the fringes of the 40-man roster, noting that since being hired to his new post, the former Dodgers GM has made 11 trades, six waiver claims and designated 12 players for assignment. It’s old hat for fans who’ve followed the Dodgers tireless roster machinations over the years, but many Giants fans were taken aback by the deluge of roster moves — particularly with so many transactions involving unfamiliar names. “This was kind of the (roster) configuration we’ve been looking for for awhile so hopefully these guys can settle into their roles,” Zaidi told Crowley, referencing the recent additions of Kevin Pillar and Tyler Austin. Zaidi goes on to discuss that despite what some onlookers may think, the decision to cut ties with even fringe roster players is never made lightly and is never an easy one. It’s interesting to consider that prior San Diego mid-season sell-off in relation to this year’s Giants club. If any team could be in position to own the early-summer market, it’s a San Francisco outfit that’s laden with veteran pitching and largely unburdened of immediate expectations to compete. The club’s bullpen has been outstanding in the early going while the rotation has seen solid openings from several elder statesmen. Nearly every member of the staff could be a plausible trade chip; indeed, the Giants have a collection of arms that could suit just about any rival’s needs. In the rotation, postseason hero Madison Bumgarner, long-time workhorse Jeff Samardzija, steady lefty Derek Holland, and higher-ceiling southpaw Drew Pomeranz. On the relief side, southpaw Will Smith continues to pitch like a relief ace, while fellow lefty Tony Watson remains a quality situational asset. Righties Sam Dyson and Mark Melancon are trending up and have ample late-inning experience, while Nick Vincent is an underrated middle relief piece. For Giants fans wondering about the future under president of baseball operations Farhan Zaidi, the most fascinating pitcher of all may be Trevor Gott, a waiver claimee who’s suddenly generating swinging strikes at a near-elite level (14.7%) after ramping up the use of a four-seam fastball he introduced last season. With pitching problems already rising up for several contenders, Zaidi and co. could be in position for a memorable summer of swapping. Giants first baseman/outfielder Tyler Austin may be heading for the IL, per Henry Schulman of the San Francisco Chronicle. Austin, whom the Giants acquired from the Twins on Monday, suffered a right elbow injury in a throwing drill on Friday and will go for an MRI. The 27-year-old has gone 3-for-9 with two walks at the outset of his Giants tenure. Per Henry Schulman of the San Francisco Chronicle, IF/OF Connor Joe has cleared waivers after being designated for assignment for San Francisco. Due to his status as a Rule-5 selection by Cincinnati (he was later traded to the Giants), Joe must be returned to Los Angeles, which left him unprotected ahead of the December draft. Joe, 26, was designated for assignment by the Giants after the team acquired 1B/OF Tyler Austin from Minnesota earlier this week. He looked overmatched in his first MLB look: in 16 PAs, Joe struck out 5 times, produced just one hit, and slung a number of awkward throws from left field. Still, his Triple-A performance over the last two seasons has been outstanding. Joe tapered off a bit after 2017’s eye-opening .304/.424/.554 slash, but his last season line was still good for a 131 wRC+ at Oklahoma City. He’ll look to again work his way into the weak-side platoon mix for a Dodger lineup always looking to upgrade their complement of right-handed bats. Giants reliever Tony Watson triggered many of the available escalators in his contract last year, MLBTR’s Steve Adams reports (Twitter link), allowing him to add $3MM in earnings to what had been a $3.5MM guaranteed salary for the 2019 season. In addition to his now-$6.5MM salary this year, the southpaw can also trigger quite a few incentives by continuing to rack up appearances. Watson and his reps were forced to get creative when his market didn’t quite develop as hoped last winter. He ended up joining the San Francisco organization in late February. The contract softened the luxury-tax hit for the club with a lower-than-anticipated annual guarantee, but also came with upside for the player. The deal promised Watson $9MM, a figure that covered two full seasons as well as a $2.5MM player option for the 2020 campaign. That option still protects his downside in the event of an injury or performance slide. Watson will surely hope his market value well outstrips it come this fall; in that case, he’ll instead take a $500K buyout. On the incentive side, the contract was known to have included $2.5MM in games-finished bonuses. That was never particularly likely to come into play and indeed has not. As Adams explains, though, it also included provisions allowing for substantial earnings for being called upon to pitch. Watson’s 66-frame 2018 showing allowed him to boost his 2019 salary to $6.5MM. He can add to that with incentive pay this year: $500K apiece upon reaching his 25th, 30th, 35th, 40th, 45th, and 50th games pitched. He’ll earn another $1MM if he can reach 55 games. There are similar numbers available for 2020, though it seems unlikely they’ll be brought into play. Add it all up, and Watson’s 2019 incentive package maxes out at $4MM — meaning he could end the present season with $10.5MM in total compensation. And it’s all quite achievable so long as he stays healthy. These contract details are obviously relevant for player and team, but they’re also notable from the perspective of potential trade suitors. There’ll be a fair bit of salary to account for if Watson is dealt this summer. It’s certainly not hard to imagine a scenario where Watson does indeed end up on the block this July. He’s a 2.66 ERA hurler through 523 2/3 MLB innings and hasn’t finished a complete season with an ERA north of 3.38 with the exception of his debut campaign. Last year, Watson rung up more than a batter per inning via strikeout while walking less than two per nine. That enabled him to carry a shiny 2.59 ERA over 66 frames and represented a reversal of some worrying peripheral trends from the prior two seasons. In the early going in 2019, the 33-year-old has shown a velocity decline (over two ticks below his career average) and managed only a single strikeout in 4 2/3 outings. But he’s also generating swinging strikes at a whopping 19.3% rate. He also hasn’t handed out a walk and has permitted just one earned run. The Giants announced Monday that they’ve acquired first baseman/outfielder Tyler Austin from the Twins in exchange for minor league outfielder Malique Ziegler. To open a spot on the roster, they’ve designated fellow first baseman/outfielder Connor Joe for assignment. Austin, 27, will add a powerful but strikeout-prone bat to the Giants’ outfield mix while providing some insurance should Brandon Belt incur an injury. The former Yankees prospect was at one point looked at as a potential pairing with Greg Bird in the Bronx, but the Yankees flipped him to the Twins last July in the trade that sent Lance Lynn to New York. The Twins, cognizant of the potential retirement of Joe Mauer, viewed Austin as a possible option at first base until they managed to land C.J. Cron on waivers when the Rays dumped his salary. Both Cron and Austin are right-handed hitters, and Minnesota’s signing of Nelson Cruz to man the DH spot in the lineup made Austin, who is out of minor league options, somewhat redundant. Last season in 268 plate appearances between the Twins and Yankees, Austin batted a combined .230/.287/.480 with 17 home runs and 10 doubles. Seventeen long balls in just 268 PAs and a .250 isolated power (slugging minus batting average) speak to Austin’s ability to make loud contact, but Austin also punched out in a whopping 35.4 percent of his trips to the plate. Austin has been more of a first baseman than an outfielder throughout his career and, in fact, has only seen 36 frames of action on the outfield grass in the Majors. He’s logged over 2600 innings of time in right field across parts of seven minor league seasons, however, so despite a lack of recent experience, he’s no stranger to the position. That said, Austin does not run well, and his lack of range is a tough fit in the spacious Oracle Park. Joe, 26, made his big league debut with the Giants this season but managed just one hit and a walk in 16 plate appearances before being jettisoned from the roster. The Reds selected Joe out of the Dodgers organization in December’s Rule 5 Draft but traded him to San Francisco late last month. He’s still carrying Rule 5 status, so any team that acquires Joe would need to carry him on the MLB roster. The Giants will have a week to trade him or pass him through waivers, and if he goes unclaimed, they’d be required to offer him back to the Dodgers for $50K. Considering Joe’s outstanding .299/.408/.527 batting line between Double-A and Triple-A last season, it’s possible that another organization will want to speculate on his potential. As is often the case with minor league contracts, catcher Stephen Vogt’s agreement with the Giants includes a June 1 opt-out chance, Henry Schulman of the San Francisco Chronicle tweets. The Giants already have three backstops – Buster Posey, Erik Kratz and Aramis Garcia – occupying 40-man roster spots, which seems to decrease the 34-year-old Vogt’s odds of earning a promotion from Triple-A Sacramento. However, San Francisco’s a fan of the two-time All-Star’s bat and could summon him at some point, Schulman suggests. The former Ray, Athletic and Brewer hasn’t appeared in the majors since 2017, having missed all of last season because of shoulder surgery. 7:19pm: Reed elected free agency and then signed a minor-league deal with the Giants, Alex Pavlovic of NBC Sports Bay Area reports on Twitter. 11:56am: Giants outfielder Michael Reed has cleared waivers and been assigned outright to Triple-A Sacramento, as first reflected on the Pacific Coast League’s transactions page. Because he’s been outrighted once in the past, Reed will have the option of declaring free agency and seeking a different opportunity. Reed, 26, went 0-for-8 in a brief four-game stint with San Francisco to open the season. The Giants picked him up near the end of Spring Training in a minor trade that sent fellow outfielder John Andreoli to the Twins, but Reed is out of minor league options and became a roster casualty following this week’s Kevin Pillar trade. Reed spent the 2018 season with the Braves organization and had a monster season split between Double-A and Triple-A, hitting a combined .342/.423/.520 over 404 plate appearances. Despite that ridiculous stat line, he only tallied seven plate appearances at the MLB level. Atlanta placed him on outright waivers at season’s end, and the Twins not only claimed him but carried him on the 40-man roster for the entire offseason. The 2019 season marks the fourth time Reed has seen action in the big leagues, but he’s totaled just 26 games and 45 plate appearances between Milwaukee, Atlanta and San Francisco. He’s a career .278/.388/.414 hitter through 869 plate appearances at the Triple-A level and can play all three outfield spots. A team with a less-defined outfield arrangement may show interest, but the Giants are currently committed to the trio of Pillar, Steven Duggar and Gerardo Parra, with Austin Slater, Mac Williamson and Chris Shaw all still in the organization as alternative options should a need arise. Giants outfielder Mac Williamson went unclaimed on outright waivers after being designated for assignment and will report to the club’s Triple-A affiliate in Sacramento, Ken Rosenthal of The Athletic reports (via Twitter). The 28-year-old Williamson was long viewed as a potential regular by the previous Giants front office but has struggled to remain healthy and regularly been blocked at the MLB level by more established veterans (e.g. Hunter Pence, Andrew McCutchen). When healthy, Williamson has generally performed well in Triple-A (.269/.327/.533 last season), and he showed brief flashes of his power potential early in the 2018 season. A concussion last May cost him some playing time, though, and he ultimately landed back in Sacramento for much of the year. Williamson finished out the season with a meager .213/.295/.383 slash through 105 trips to the plate as a big leaguer. It’s not terribly difficult to envision Williamson earning another look with the Giants down the road this season. Although San Francisco acquired Kevin Pillar from the Blue Jays earlier this week, their starting trio of Pillar, Steven Duggar and Gerardo Parra isn’t exactly an iron-clad collection of established producers. Parra has struggled in recent seasons and had to settle for a minor league pact this winter, while Pillar has generally provided premium defense but an inability to keep his OBP north of .300. Duggar has yet to log a full season in the Majors. Each of the three figures to have a reasonably long leash, but Williamson will at least have the opportunity to force the issue of a return to San Francisco now that he’s remaining in the organization. The Giants and Blue Jays have announced a trade that will send outfielder Kevin Pillar to San Francisco. Heading back to Toronto in return are righty Derek Law, recently designated infielder Alen Hanson, and righty Juan De Paula. The Giants designated outfielder Michael Reed to create roster space. He joins both Law and Hanson as recent 40-man roster casualties. Law had already been outrighted prior to this move, while Hanson was still in DFA limbo. It’s not immediately clear how the Giants will line up in the outfield. Youngster Steven Duggar is likely in line for most of the time in center, but Pillar would offer a platoon match there — the former hits from the left side, the latter from the right — and could also spend time in the corners. He was obviously preferred to the untested Reed, who was added to the mix via late in camp. Pillar, 30, has some pop but struggles in the on-base department. He’s a lifetime .260/.297/.396 hitter, but has been better (100 wRC+) against left-handed pitching. Pillar’s appeal lies in his glovework and baserunning. While metrics dimmed on his overall defensive work last year, Pillar has a history of outstanding work up the middle and has one of the game’s most impressive highlight reels on the outfield grass. He could end up being moved at the deadline, kept as a one-year fill-in piece, or kept for 2020 via arbitration (his final season of control). For the Jays, Pillar simply wasn’t part of the long-term plans. This transaction is the latest that clears out roster space and sheds some payroll. The club could have held onto Pillar in hopes that he’d turn in a quality first half and become a mid-season trade chip, but will instead drop his $5.8MM salary and open the door for Anthony Alford to get a shot at the majors. The Toronto organization does pick up a few potentially helpful roster assets in Law and Hanson. The former had a nice 2016 debut but has struggled since. Law will be available as a depth relief piece if a need arises. Hanson, 26, was a major contributor least year in San Francisco but faded down the stretch. He could take up a utility role, though the Jays have several such players on the roster already. But the only player with notable potential future value is De Paula, a 21-year-old who has had some success in the minors. He reached the Class A level last year, making one start there. Over 233 innings in parts of four seasons in the low minors, he carries a 2.47 ERA with 8.8 K/9 and 3.0 BB/9. De Paula originally came to the Giants last year in the swap that sent Andrew McCutchen to the Yankees. As JJ Cooper of Baseball America notes on Twitter, he has now been swapped three times already in his still-nascent career. 10:49am: The clubs are close on some kind of trade, Henry Schulman of the San Francisco Chronicle reports on Twitter. It’s frankly possible to imagine a variety of scenarios. Speculatively, the Giants could send some veteran pitching to Toronto, or the potential transaction could involve prospects or even other teams. 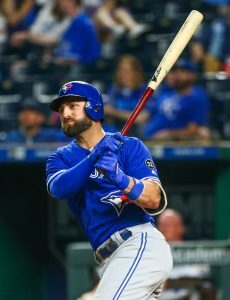 10:45am: The Giants are engaged with the Blue Jays in trade talks regarding Toronto outfielder Kevin Pillar, according to Jon Heyman of MLB Network (Twitter link). It’s not clear how likely a deal is at this point. This is hardly a typical time of year for swaps to come together, except in cases of 40-man roster casualties. But there may yet be some unfinished business around the league. These two organizations are among several that could conceivably allow the offseason to drag into the 2019 campaign. Neither figures to contend this year, but both have significant resources and are surely interested in finding creative ways to improve their outlook for the near future. Pillar has been on the Giants’ radar for some time now. He’s a defensive standout who hasn’t managed to produce consistently at the plate. With a $5.8MM salary, Pillar isn’t cheap but is also a rather affordable asset for teams in these tax brackets. He’s controllable via arbitration for one more season to come. The Giants are the only team known to be involved in the Kevin Pillar trade market, though Rosenthal notes that the Blue Jays have also talked with multiple other teams about the center fielder. Pillar offers two years of team control and a center field glove that was elite from 2015-17, as per the UZR/150 and Defensive Runs Saved metrics. Last season, however, Pillar’s glovework was rated closer to average overall, and he has yet to post even league-average run production over his six MLB seasons. If a trade did take place, Pillar would join Kendrys Morales, Russell Martin, and Troy Tulowitzki as Jays veterans sent out of town as Toronto makes room for its younger players. The Braves acquired Matt Joyce from the Giants last weekend, just three days after Joyce joined San Francisco on a minor league contract. Rosenthal provides some details on the transaction, stating that while the Giants were prepared to part ways with Joyce regardless, Atlanta chose to send some cash to the Giants in a trade rather than simply sign Joyce when he became available. Since league offices were closed last Saturday on the day of the trade, Joyce’s arrival in the Braves’ spring camp could have been further delayed had the two sides been required to wait for the contract to be officially approved. With a trade, however, Joyce was able to get some time in Atlanta’s camp, which led to his placement on the club’s Opening Day roster (Joyce marked his first PA with his new team by swatting a pinch-hit homer). 1:06pm: The Mariners have announced the trade. To make room for Murphy on the 25-man roster, Freitas has indeed been optioned to Triple-A Tacoma. 12:55pm: The Mariners will send minor league righty Jesus Ozoria to the Giants in return for Murphy, according to Greg Johns of MLB.com. The 20-year-old Ozoria has yet to pitch above Rookie ball but logged 49 1/3 innings of 2.19 ERA ball there last season. Ozoria turned in a brilliant 59-to-7 K/BB ratio in that time and paired it with a 39.3 percent grounder rate. He’s a long way from MLB readiness but seemingly adds a live arm to the lower levels of the organization. The long-term question will be one of whether Ozoria carries more value than righty Merandy Gonzalez, whom the Giants designated for assignment when claiming Murphy; the move, in essence, swaps those two pitchers out while also clearing a spot on the Giants’ 40-man roster. 7:20am: The Mariners have reached a deal to acquire catcher Tom Murphy from the Giants, reports MLB Network’s Jon Heyman (via Twitter). San Francisco claimed the out-of-options Murphy from the Rockies earlier this week but did not carry him on the Opening Day roster, ultimately designating him for assignment just days after initially claiming him. Seattle has an open 40-man roster spot, so a corresponding move isn’t a necessity. Currently, Omar Narvaez and David Freitas are the only catchers on Seattle’s 40-man roster, so Murphy figures to supplant Freitas as the primary backup/platoon partner for Narvaez. Freitas has options remaining and can freely be sent to Triple-A without first being placed on waivers. Murphy, 28 next week, was once considered to be among the game’s top catching prospects but hasn’t produced at the plate in limited Major League opportunities across the past couple of seasons (.188/.221/.325 in 122 plate appearances). The Rockies, who owe veteran Chris Iannetta nearly $5MM through contract’s end, opted for a more defensive-minded second catcher in Tony Wolters when they cut Murphy loose. Murphy, however, isn’t a poor defender by most measures. He sports average caught-stealing rates in both the Majors and minors throughout his career, and while he’s not a standout in terms of pitch framing, he’s been a bit above average in that regard over the past three seasons combined. At the plate, Murphy raked at a .266/.341/.608 clip through his first 88 plate appearances from 2015-16. He has a career .286/.335/.567 batting line across 875 Triple-A plate appearances, including a .258/.333/.568 slash in 264 PAs a year ago.